JUBA, Aug 28 2014 (IPS) – “What is the benefit when children are crying and people are dying due to hunger? There is no need to cry when you have the potential to dig,” sings Juba-based dancehall reggae group, the Jay Family, in their latest single “Stakal Shedit,” which means Work Hard in Arabic. In the Stakal Shedit video, the three members, Jay Boi, Jonio Jay and Yuppie Jay, are seen sporting denim overalls and rubber boots with garden hoes slung over their shoulders. 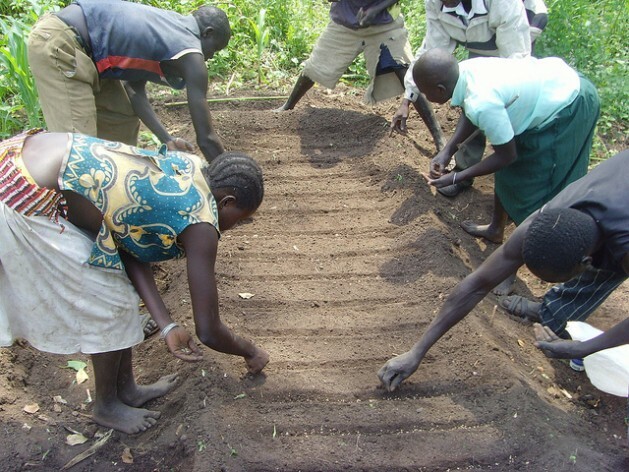 The objective is to motivate youth to engage in agriculture as a means to fight food insecurity in South Sudan. The Food and Agriculture Organisation of the United Nations states three-and-a-half million, or almost one in three South Sudanese, are facing a severe food crisis as the conflict-ridden nation is on the brink of starvation. The Jay Family comes from Yei, South Sudan, 100 kms southwest of the capital, Juba. The group formed in 2010 with the objective to spread South Sudanese music to all parts of East Africa and beyond. The Stakal Shedit music video was shot at the Rajaf Prison farm outside of the capital, Juba. Prisoners are seen farming in the video. “We learned from the prisoners how to distribute seeds. In the video we were cultivating maize, okra, tomatoes, carrot and cassava,” Jay Family’s manager, Stephen Lubang, told IPS. The group calls on South Sudanese youth to consider agriculture and agri-business, instead of violence, as a way to combat unemployment and generate income. In the song the group addresses how poor infrastructure, like roads, can frustrate people starting small business. Last May, a group of 12 South Sudanese artists united in calls for peace when news of British explorer and journalist Levison Wood’s 6,000 km trek along the Nile River reached Juba. “Let’s Stand Together” was recorded by South Sudan All Stars. The song urges political leaders to reconcile at the Addis Ababa, Ethiopia peace talks. Silver X is a 26-year-old South Sudanese musician who wrote the song “Let’s Stand Together.” He was displaced from his home in Torrit, South Sudan with his family in 2000. Four years ago he returned to his birthplace from a refugee camp in Uganda to launch his music career and help jumpstart South Sudan’s burgeoning music industry. Moro Lokombu is a radio journalist and host of The Beat, a music programme highlighting South Sudanese music, at Juba’s United Nations-run Radio Miraya. On Jun 16, the Jay Family, along with Silver X, launched a national campaign called “Music Against Hunger” at the Juba Regency Hotel. Dates are now set in September for performances in the southern cities of Nimule and Yei with more to come.